The Santa Maria Valley Chamber of Commerce is proud to be a Certified Green Business through the Green Business Program of Santa Barbara County! The Green Business Program of Santa Barbara County (GBPSBC) is part of the California Green Business Program, a network of local programs operated by counties and cities throughout California. The GBPSBC provides resources and assistance to businesses wanting to be green, certifies businesses through workshops and trainings, on-site visits and evaluation, and highlights Certified Businesses so that local consumers can shop green. 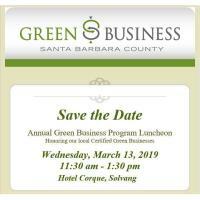 Please mark your calendars for Wednesday, March 13, 2019, 11:30 to 1:30, at Hotel Corque in Solvang, the GBPSBC will be honoring over two dozen new local Certified Green Businesses! Their Keynote Speaker is Seth Streeter, Founder of Sustainable Future. If you’d like to be added to their email list to receive an invitation or have any questions about becoming a Certified Green Business, please contact the Green Business Program of Santa Barbara County at Coordinator@GreenBizSBC.org. We hope to see you there!